In December, 1917 simply petered out with the German troops still in overall control of the Western Front battlefields, having given up little ground. For over four hundred miles from the sand-blown wastes of the coast at Nieuport, through the sordid mud of the Ypres Salient, the chalk of Vimy Ridge, the abattoir of the Somme and into the Noyon Salient; through the devastation of Champagne and the shattered-trees of the Argonne Forest; through the bone yard of Verdun, past the concrete stronghold of the St. Mihiel Salient, beyond Pont-a-Mousson and south to the high ground of the Vosges mountains and thus to the Swiss border, the armies tried to make their miserable daily life as comfortable as possible as winter approached -- and to stay alive. 1917-18 Winter in the Trenches In Italy the eleven battles on the Isonzo river had culminated with a twelfth struggle to become known as Caporetto. Italian and Austrian casualties in three years totaled 900,000 men. The Russian Revolution and the ensuing peace agreements in that unhappy country meant that the Germans could free up some 80+ divisions for the Western Front for the next year. They were to arrive and go into action in March and April 1918, and these epic battles will be written of in future Trip-Wires. Hope for a successful end to this unending war within the British and French forces faded with the end of 1917. In Germany, unrest was stirring within the population and the British naval blockade was biting hard, affecting everyday life in the German Empire. America had come into the war in April, but the willingness of the President could not be matched quickly by the efforts of the U.S. industry and military. Most of 1917 was taken up in organising for the producing and equipping of eighty 28,000-man divisions, as envisaged by John J. Pershing, Commander of the American Armies in France. The world waited for the Americans with hope or with fear. The great holiday of the Great War was celebrated in different ways in 2007. On the left above, your editor is shown at the General Pershing statue in San Francisco's Golden Gate Park with WFA-USA officers Susan Hall-Balduff, Editor of the Association's Journal Camaraderie, (she's the redhead), and Susan Neeson, Chair of the West Coast Chapter (the brunette). WFA-USA Director Richard Vandenbrul was behind the camera. This was one stop in my "San Francisco and WWI" tour I give to my fellow enthusiasts. 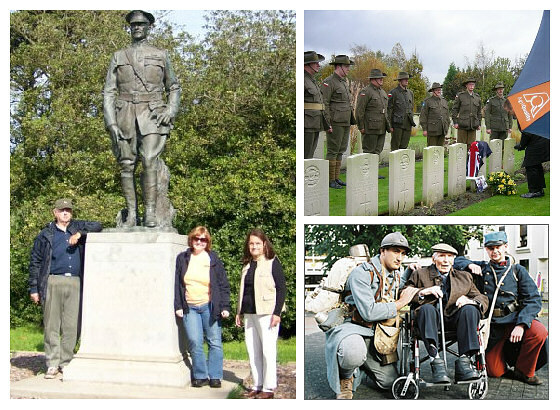 Above right, Digger reenactors honor the fallen at Harlebeke New British Cemetery in Flanders. Below, two French reenactors in Paris visit with 109-year-old veteran of the French and Italian armies Lazare Ponticelli. Lazare and Louis de Cazenave, 110, are the last two surviving Poilus of the Great War. Both, interestingly, have declined the honor of a state funeral, not wanting to place themselves apart from so many of their compatriots who died without such recognition. This is simply the best account of any battle from any war I've ever read. It also has the best and most helpful maps I've encountered. 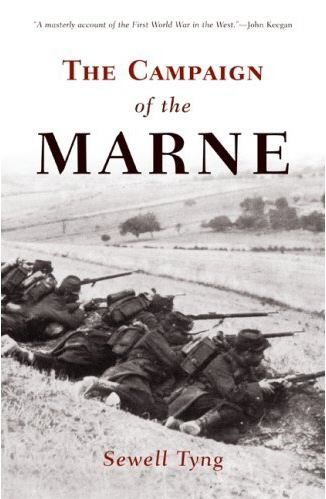 Completed in 1935 by a former ambulance driver from the war, who was also Herbert Hoover's private secretary at the Paris Peace Conference, The Campaign of the Marne, has recently been reissued by U.S. publisher Westholme as a large format quality paperback. This would make a fine Christmas gift for any World War I student or enthusiast. Prior to the development and use of atomic weapons, the greatest man-made (although unintentional) explosion probably occurred on December 6th, 1917, just ninety years ago this month in the City of Halifax, Nova Scotia, Canada. Halifax is the closest mainland port to Europe and was a homeport for the Royal Navy until 1905. After that it served as a port for the Royal Canadian Navy. A large natural harbor and ice-free in winter, its strategic importance was of great value during World War One with convoys being assembled with Allied ships from the eastern seaboard destined for the United Kingdom and war-torn Europe. On December 6th, 1917, a French cargo ship, the Mont-Blanc, carrying wet and dry picric acid, gun cotton, TNT and drums of benzol collided with the Imo, a Belgian relief ship in "The Narrows" shipping channel in the port of Halifax. After the collision, the Mont-Blanc drifted close to shore. The fire caused by the collision and the exploding barrels of benzol shooting into the air drew fire fighters and a crowd of onlookers down to the docks. Other curious inhabitants watched from roofs and windows. Shortly after 9 AM, the Mont-Blanc exploded with the force of approximately 3 kilotons of TNT, the equivalent of a tactical nuclear weapon. The force of the blast caused a tsunami that swept over the crowd and carried their bodies into the water. The blast effect destroyed buildings, toppled chimneys, blew in doors and shattered windows throughout the city. Ships were tossed on shore. Trees were snapped. The anchor shaft of the Mont-Blanc was hurled 2 ¾ miles crashing to ground on a farm on the outskirts of the city. The blast was heard in North Cape Breton, 225 miles to the east. The fires started by overturned ovens and furnaces were fueled by stockpiled winter fuel supplies. 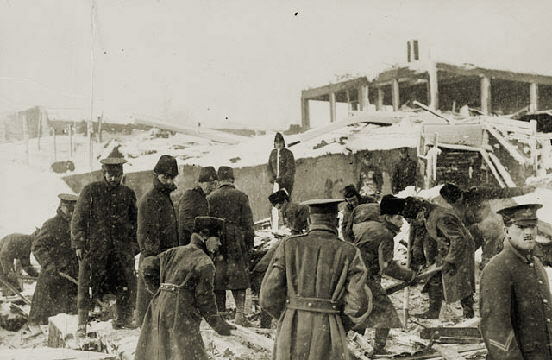 Many initial survivors trapped in the rubble were burned to death. The following day a blizzard buried the city in snow. Victims still trapped were buried by the snowstorm. 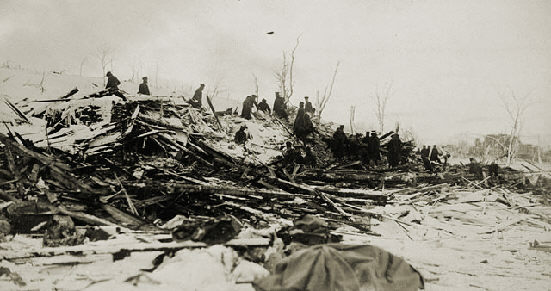 The last of the survivors were found six days after the initial explosion. Corpses were discovered for nearly a year afterwards. The approximate casualty estimate is 2,000 killed and 9,000 wounded and blinded. 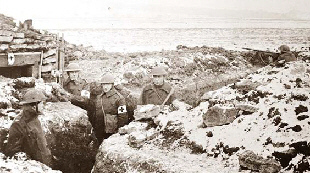 More Nova Scotians died in the Halifax explosion than were killed in World War One. Out of 60,000 inhabitants, 25,000 were left homeless. So many people suffered eye injuries that the science of treating damaged eyes was advanced significantly by the newly established Canadian National Institute for the Blind. Halifax would become known as a center for caring for the blind. Relief efforts started almost immediately from nearby towns. Medical personnel from ships in the harbor came ashore. Even before the total magnitude of the disaster was known, relief was on the way from the rest of Canada and from the United States. The first American medical relief train from Massachusetts arrived on December 8th. The first relief ship from the rival port of Boston arrived in Halifax on December 12th with clothing, food, window glass and other materials. Trained glaziers came to install the new panes. A second American ship with a valuable cargo of ten trucks arrived on the 13th. Eventually aid was received from all over Canada, the United States and from the United Kingdom. Even Australia and New Zealand sent contributions. Since 1971 the Province of Nova Scotia has sent an annual Christmas tree to the city of Boston as a symbol of appreciation for the relief received from Massachusetts. 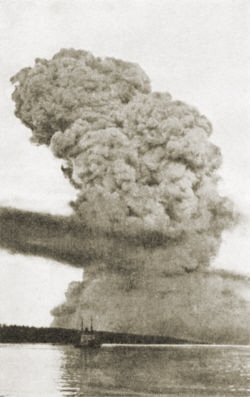 In 2003 the Canadian Broadcasting Corporation produced two programs covering the Halifax Explosion. Both are available on DVD from Morningstar Entertainment in Canada, which is where I obtained my copies. 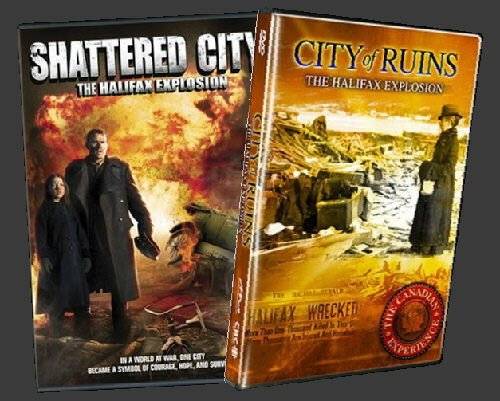 Shattered City: The Halifax Explosion is available from RHI Entertainment in the United States. City of Ruins: The Halifax Explosion is a well-done forty-five-minute documentary directed by Alan Mendelsohn and written and produced by Sally Reardon and Mendelsohn. It incorporates archival newsreel footage and photographs and special effects footage from Shattered City: The Halifax Explosion mini-series. City of Ruins also includes two CBC-TV featurettes. Explosion Sites Today has Jim Simpson leading a walking tour of Halifax harbor, discussing the tragedy and pointing out the still-existing material evidence of the explosion. The 2nd featurette, Explosion Survivors is an emotional July 2003 visit of childhood survivors to Halifax. They tell the same stories as they have over the decades to so many, and still the trauma of the events rises to the surface. Shattered City: The Halifax Explosion is less successful in its depiction of the disaster and its aftermath due to the historical distortions and inaccuracies it contains. Produced by Heather Haldane and Jenipher Ritchie, written by Keith Ross Leckie and directed by Bruce Pittman, Shattered City has excellent production values. The special effects and CGI sequences are very well done and much better looking than the CGI in the Above And Beyond mini-series (see review in the April 2007 issue of The St. Mihiel Trip-Wire). The historical settings, production design and costumes all seem appropriate to the period. The story line follows members of a fictitious Halifax family, the Collins, and their experiences before, during, and after the disaster. The acting is overall of the high quality I've come to associate with modern Canadian productions. Vincent Walsh as war-weary Captain Charlie Collins gives an excellent portrayal of a man who has seen too much of war and finds his home town leave turned into an experience as terrible as anything he has experienced on the Western Front. Shauna MacDonald, better known to Canadian audiences for her ensemble television comedy work, is Boston doctor Barbara Paxton who manages to fall in love with Captain Collins amidst the ruins of Halifax. One of the advantages of watching a CBC-TV production is being introduced to unfamiliar actors who give excellent performances. Two familiar faces are Graham Greene as Elijah Cobb, who gives important testimony in the criminal manslaughter trial and Pete Postlethwaite as attorney Charles Burchell. Unfortunately, the script has some major errors. First, it has a German spy ring planning sabotage on the Mont-Blanc with prior knowledge of its arrival in Halifax. There were no German spies in Halifax. Second, it presents a post-disaster criminal manslaughter trial riddled with conspiracy and government intervention. This trial appears to be based on a Naval Inquiry, an actual criminal manslaughter trial, and a civil court case that all occurred at different times. Even the outcome of the depicted trial is at variance with actual events and accused parties! Last, the mini-series depicts Halifax as without surgeons and with only two makeshift hospitals until the surgeons and medical personnel arrive from America. Actually, there were a half-dozen local hospitals functioning in addition to nearby military medical facilities. The Shattered City: The Halifax Explosion DVD is widescreen but not enhanced for widescreen televisions. If your DVD player or TV has a zoom function you'll need to use it to fill a 16 x 9 set. The Dolby Digital Stereo was well produced and did the job of conveying all the explosion effects. Special features include Cast and Production Biographies, a Behind the Scenes Photo Gallery, Special Effects Scenes, Behind the Scenes featurette, an Interview with Executive Producer Mary Young Leckie, a Glamorous Life of a Film Extra featurette and a CBC-TV News featurette on Explosion Survivors. I can certainly recommend the documentary City of Ruins: The Halifax Explosion as a worthwhile addition to your library of World War One documentaries. The mini-series Shattered City: The Halifax Explosion was certainly well produced, well acted and entertaining, but any viewer should be aware of its historical inaccuracies and distortions prior to watching. As part of our Christmas special edition, I've been asked to recommend a new WWI DVD suitable as a holiday gift. 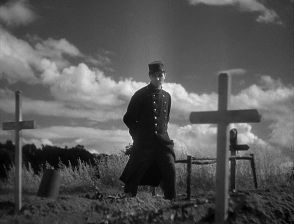 I suggest Raymond Bernard�s outstanding 1932 film Wooden Crosses, considered the French equivalent to All Quiet On the Western Front, which was issued in July by Eclipse films -- a subsidiary of Criterion. It comes in a set with Bernard's Les Miserables, considered by some experts to be the finest film dramatization of Victor Hugo's great novel. Click here to order this excellent set (link). A.M.
Andrew Melomet, Proprietor of Andy's Nickelodeon, will answer your Great War film or video inquiry. He wants your recommendations for the WWI Filmography he is compiling for our readers. Just click HERE. 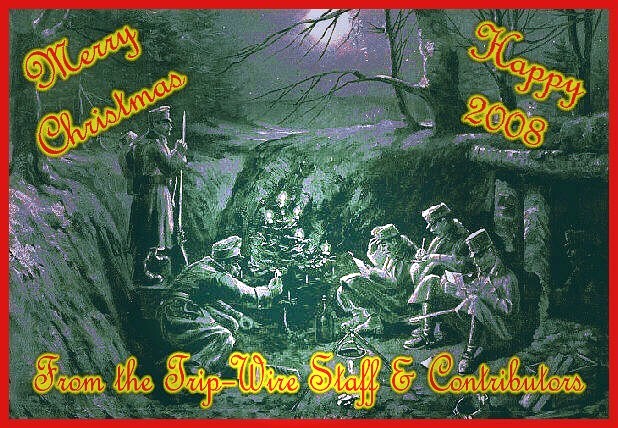 The following are thanked for their contributions to this issue of the Trip-Wire: Gary Van Loon, Tony Langley, Christina Holstein, Bob Ford, Tony Noyes, Andy Melomet, Kimball Worcester, and Richard Vandenbrul. Until next month, your editor, Mike Hanlon.